Authoritarian states are using all-too familiar constitutional mechanisms to consolidate power. Fatima Mövlamlı. Source: Youtube.Fatima Mövlamlı, an Azerbaijani teenager, is used to seeing İlham Aliyev, her country’s president, everywhere: on TV, street billboards, on portraits at her school and health clinic. The man would always be kindly smiling in various settings: surrounded by children, villagers, workers, happy citizens of prosperous Azerbaijan. His seemingly omnipresent, inescapable smile watched over her as she grew up. But when Fatima turned 17, she looked around and saw a different picture: in the city where she grew up, although the dictator smiled at everyone from the posters, big and small, people rarely smiled back. Their faces conveyed anxiety, they seemed preoccupied with making ends meet as officials made pronouncements on the health and strength of the economy, constantly repeating the adjective “analogue-less” in reference to Azerbaijan. The smiles were slowly and gradually giving way to disquiet, fear and hopelessness. When she looked around, Mövlamlı saw a country ruled by a dictator. This is why when Ilham Aliyev called for snap elections in February 2018, she decided to act. 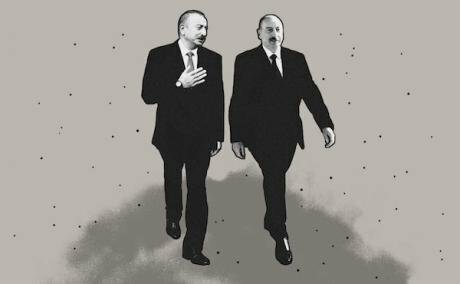 On 26 March, Mövlamlı left home with posters of Ilham Aliyev to take part in the “Know Your Dictator” campaign, launched by Azerbaijani emigres in Europe in order to draw attention to Aliyev’s rule. The posters contained a QR code with further information, and Mövlamlı was determined to inform people of the dictatorship and its use of elections to further consolidate Aliyev’s grip on power. “I did this to demonstrate that our youth hasn’t lost the ability to fight, and to give people reason to summon their courage,” she says. Mövlamlı was immediately summoned to the Binagadi district police station in Baku, where she was interrogated for five hours. After her release, Mövlamlı attended a 31 March protest, proclaiming that detention can’t make her stop campaigning. She says she was kidnapped by the authorities after the rally and, in direct contradiction of Azerbaijani laws, kept incommunicado from her family and friends for five days. 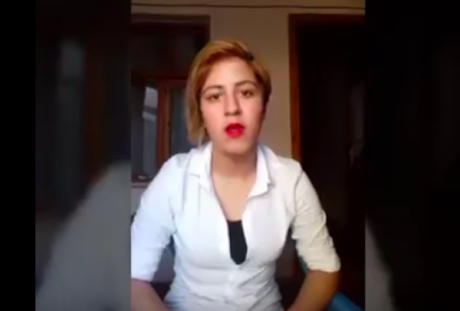 In a video published a few days after her release, Mövlamlı claims she was forced to undress, then a video of her was taken and she was held for days without access to her family or lawyer at the Main Department on Combating Human Trafficking. To Mövlamlı and others who participated in this campaign against the 11 April snap elections, the fact that that they happened without much condemnation from the international community, and that Ilham Aliyev secured a fourth term, was a tragedy. But for the Aliyev regime, much like other dictatorships across Eurasia, these elections were simply a mechanism of further power usurpation. While for Mövlamlı, Aliyev’s fourth presidency is a curse of another seven years that she has to battle, across Eurasia it was just one domino tile of many. Notorious for copying each other’s authoritarian traits, whether taxation of NGOs and “foreign agent”-style legislation or imprisoning political opponents on petty criminal charges, Eurasia’s dictators have discovered yet another technique: call snap elections, seize the political momentum and rig the results while society is dazzled, the opposition is in turmoil and the international community’s attention is elsewhere. Across Eurasia, snap elections happen rather frequently. In some contexts, such as after revolutions and during political crises, they are justified (Kyrgyzstan, possibly soon Armenia). In other contexts, while there are clearly circumstances that do require snap elections, it’s also obvious that this mechanism is used by authoritarian regimes to their benefit (Turkey). And then there are clear-cut dictatorships that shamelessly use snap elections to run their own show (Kazakhstan, Azerbaijan), and once one country is able to pull this trick off, others start replicating it. “One way of looking at what purpose snap elections serve is: what purpose do elections serve? If elections are a complete show, snap elections are probably also a complete show. Generally, snap elections are critical to the point that elections are critical, as a general rule of thumb,” says Karabekir Akkoyunlu, a research associate at the Centre for Southeast European Studies, University of Graz. Ilham Aliyev, president of Azerbaijan. Image: anastasia vikulova. All rights reserved.In democracies, snap elections usually happen at a time of a political crisis, says Anar Mammadli, Chairman of Azerbaijan-based Election Monitoring and Democracy Studies Center, referring to elections in the UK, Czech Republic and Turkey, before the country succumbed to authoritarianism. But in authoritarian states, such as Kazakhstan in 2015-2016 and Azerbaijan this year, the snap elections mechanism is being used to further consolidate power. Snap elections matter in places where they can create some sort of unpredictable change, says Karabekir Akkoyunlu. But in states like Kazakhstan (snap elections in 2015 and 2016) and Azerbaijan, snap elections demonstrably bring no significant change. In Kazakhstan, the elections in general haven’t mattered much for the past 20 years, says Andrei Grishin of Kazakhstan International Bureau of Human Rights, even prior to the snap election the number of government-supporting parliamentarians was very high, but president Nursultan Nazarbayev, who has ruled the country since 1991, was concerned about losing public trust and therefore used administrative resources to further usurp power. “We didn’t have any political crisis. Nazarbayev suddenly announced that we needed changes, and we had the snap elections. As a result, he simply consolidated more power,” Grishin adds. But when Kazakhstan did it, nobody blinked an eye in the international community, and after a couple of usual statements of concern, everyone went back to business as usual. But while international organisations never bothered to check out of the kingdom of Morpheus, across the Caspian Sea, in another regime, Azerbaijan, president Aliyev and his team were watching closely and taking notes. The snap election mechanism was a flashy new toy to play with, all while consolidating yet more power. 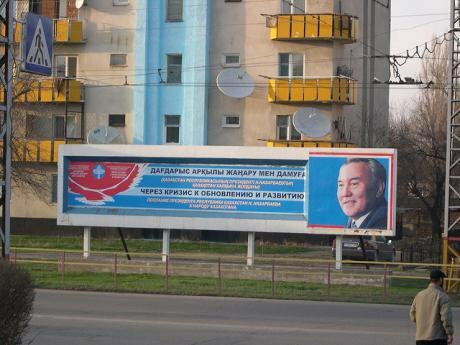 President Nazarbaev's message to the people of Kazakhstan: “Through the crisis to renewal and development”. Photo CC BY 2.0: upyernoz / Flickr. Some rights reserved.But Aliyev couldn’t just call an election straight away. So first he called a referendum in 2016, which extended presidential term limits and gave the president the authority to call presidential elections at any time. This move, in a way, predicted the April 2018 snap elections, says Anar Mammadli. “The referendum gave additional powers to the president, such as extending the presidential term to seven years, created the institute of vice-president, who is appointed by the president. At the same time, in 2016 the human rights crisis in Azerbaijan had worsened, so did the relations with the West; and the social-economic crisis has resulted in a certain discontent among the people,” says Mammadli, adding that by calling snap elections in April 2018, Aliyev tried to extend maximum control and usurp power even further. Indeed, presidential elections were to be held in October 2018, but Aliyev moved them to April. The 2016 referendum and previous electoral code changes have limited the opposition and practically removed all effective campaigning tools. But, by moving it to April, Aliyev avoided whatever international outcry could possibly result from it, because the international community was busy with the Russian presidential elections and escalation in Syria. According to Mammadli, Aliyev was also concerned that with the worsening economic situation, inflation and increased unemployment the fall might bring surprise socio-economic protests – and this is a scenario he’d rather not face. In the cases of Kazakhstan and Azerbaijan, calling for snap elections had to do with lust for more power, reinforcing the legitimacy of the president, mobilising different parts of the power vertical, says Nate Schenkkan, Director of Nations in Transit at Freedom House. “You force everyone to demonstrate their loyalty. That's how they get the numbers they want. You make sure students, doctors, etc. are mobilised during the election. It's a way to check the system, and to demonstrate power. You show how you can make this happen, fast and unscheduled,” Schenkkan adds. In these cases of authoritarian rulers, when using the snap elections, power holders make it clear to society, the political landscape and the international community that “they have the initiative to decide when elections can be held” and that “they have the power to infuse a (degree of) unpredictability in the political arena which authoritarian rulers do use,” says Karabekir Akkoyunlu, explaining that the snap elections give the ruler “the power to control further dynamics”. He reminds us, however, that the same logic applies to snap elections in democratic systems, as well. “Whoever has the ability to call the shots presumably does so in a way that fits their interests. So, we could even talk about this in a liberal democracy,” he adds. But just a month away the region is to see another snap election, this time, in Turkey. While an argument can be made that the situation is fundamentally different under Recep Tayyip Erdoğan, a number of trends resemble Eurasia’s solid authoritarian regimes. In Turkey, snap elections have for a long time been a constitutional mechanism used by politicians at times of crisis or change. During the 1980s and 1990s, collapsing fragile coalition governments, perceived turns towards socialism or Islam, all ended in early elections – both with and without tanks in the streets. However, with what some qualify as an increasingly authoritarian rule of the former Prime Minister-turned-President Erdoğan, the element of unpredictability has faded as his party, AKP, has consistently gained the majority in the parliament. This has meant AKP hasn’t had to form fragile coalition governments with other political parties like so many of its predecessors. In this climate, snap elections are used for different purposes and under different circumstances this altogether: “They still are a competitive authoritarianism. But we have similarities,” says Anar Mammadli, comparing Turkey to Azerbaijan, which, though they share geographic proximity and cultural ties, have very different political systems. 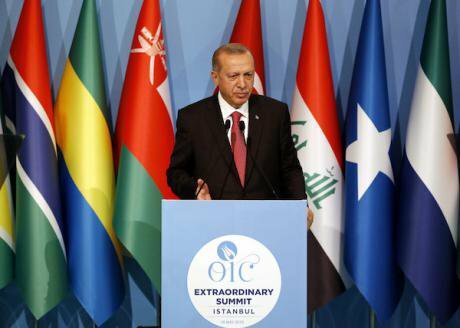 Turkish President Recep Tayyip Erdogan speaks at a press conference during an extraordinary summit of the Organization of Islamic Cooperation (OIC) in Istanbul, Turkey, on May 18, 2018. Photo: Xinhua / Anadolu Agency. All rights reserved.“Snap elections aren’t inherently wrong, and this is the argument that Turkey makes,” says Nate Schenkkan. When critics condemned the emergency situation and claimed that it had limited and shrunk the space for political campaigning, the Turkish government pointed to the French snap elections held in France in 2017, which were also held in an emergency situation. “This was a different kind of emergency,” Schenkkan clarifies. As elections do not happen in a vacuum, there’s something to be said about the role of the international community in observing, validating and legitimising these processes, both at the level of nation-states and their groupings: “Individual countries can certainly (condemn the process or the outcome), and embassies and ambassadors who have a particular profile in the world, and the U.S., has been one of that sort, do so,” says Anthony Bowyer. According to him, international organisations, such as the Council of Europe, as well as member-states of these bodies “have a lot to lose by having a flawed election or political process” within their borders. Anar Mammadli admits that there are no specific international mechanisms to prevent a snap election without a reason, but says there are international documents that express principals under which such elections could he held. “According to the UN convention on civil and political rights, the elections have to be held within a reasonable time. So there is a principle, but no mechanism. Because electoral process has a lot of national specifics, it is hard to call it to account. There are no universal mechanisms. In that regard, one needs to look from the point of each citizen's opportunity to use his or her right to make a political choice,” he adds.